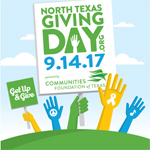 North Texas Giving Day is 9/14/17 (6:00 am to midnight). If you appreciate the efforts of CPSH, give, give, give! Anyone, anywhere may donate to CPSH on this day. CPSH has chosen to North Texas Giving Day as our biggest community fundraiser of each year. Aligning with NTGD allows us to decrease our fundraising expenses by being part of the the Community Foundation of Texas' branding and donation collection system. Bonus funds are added to each donation over $25, so your donation is multiplied! Please mark your calendar for 9/14/17 and give generously to CPSH. The direct link to donate to CPSH will be available on 9/14/17.